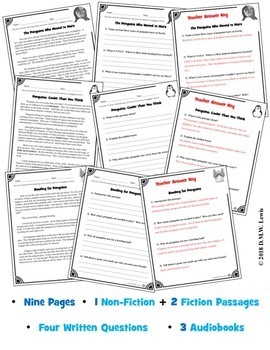 Need winter reading comprehension students LOVE?! 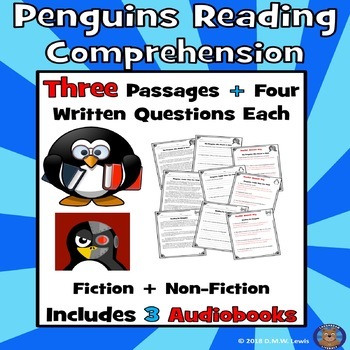 Three PENGUINS paired reading comprehension passages with four written questions and three fully produced audiobooks that bring comprehension to life. One NON-FICTION "Penguins: Cooler Than You Think" + FICTION "The Penguins Who Moved to Mars" and “Bowling for Penguins”. Three easy-prep passages that can be used as a paired text reading or separately. OTHER ARCTIC & WINTER ANIMALS + AUDIOBOOKS! 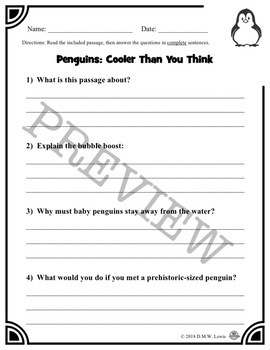 Introducing Mister Lewis’ paired PENGUIN comprehension passages! • The fiction passages will make students ENJOY READING. • The non-fiction passage will help teach NEW FACTS. • They each ASK four written questions each that focus on comprehension skills. • They offer self-reflection for further engagement. This pack is best recommended for 3rd grade, but also for STRONG and or G/T 2nd, or early 4th. These are perfect for practicing reading comprehension as we study the majestic penguin. These two passages are from my 24 Fiction January and 24 Non-Fiction January Reading Comprehension packs. If you've purchased either of these, please do not purchase this item or you will end up with a double. If you haven't yet purchased these, they will save you TONS of money vs. buying singles. 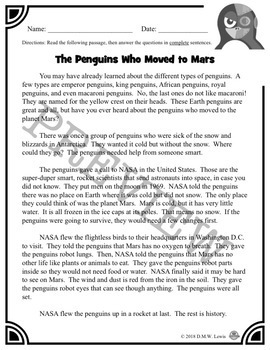 Fiction passage, "The Penguins Who Moved to Mars", is an original tale of fiction about the time a group of penguins decided they wanted a place that was cold but didn't snow, so they called NASA for a solution. Although it is fiction, students will pick up some great facts about Mars. Fiction passage, "Bowling for Penguins", is an original tale of fiction about a group of bored penguins who invent penguin bowling, using themselves as the ball and pins. What are TPT TEACHERS saying about using these audiobooks in class? "I am using your AUDIO sets for the end of the year, and my students LOVE these sets! They are SO engaging!!!! THANK YOU! I know these sets are time consuming to create. The sound effects are AWESOME, and we all look forward in listening to each of the readings." - Linda J. "Thank you so much! I use your stories with my Life Skills students. My student so enjoy your stories! They enjoy all the silly sounds. It really keeps my students engaged. I look forward to more of your audiobooks." - Rebecca V.
"A fun and engaging way to do fluency with class." - Katie B. TELL ME ABOUT THE AUDIOBOOKS! The audiobooks were narrated and produced in Mister Lewis' home studio (a tiny Wizard of Oz style closet), including wacky sounds to incorporate more senses into literacy time. Audiobook plus reading passage to follow along! WHY SHOULD I USE AUDIOBOOKS FOR LITERACY??? Paired Passages to Get Kids Reading! Leaving feedback earns you points toward FREE TPT purchases. Plus, I love hearing from you! FOLLOW ME and be notified when new products are uploaded. New products are always 50% off for the first 72 hours they are posted. It pays to follow me! As always, please contact me with any questions at DMWLewis@gmail.com!